MDC supporters protested in Harare on Wednesday after the electoral commission announced that Zimbabwe’s ruling party had won a majority of seats in Parliament and the country braced itself for the first official results of the presidential election. Photo: Mujahid Safodien. I could hear gunshots from every direction. People were fleeing from MDC supporters, protesting the election results, who had barricaded roads. Most of the protesters had dispersed but soldiers were chasing after people uninvolved in the protests. Some women were carrying children on their backs. Military forces chased protesting MDC supporters in Harare. Photo: Mujahid Safodien. Some men, possibly MDC supporters, started chanting slogans, “Chinja, Chinja” which means “it’s time for change”. But the words were ignored by the soldiers who were driving everyone out of the city centre. Some people jumped into taxis, while others left on foot. Street kids and blind beggars who normally hang about on street corners hurried away to avoid being caught by the soldiers. 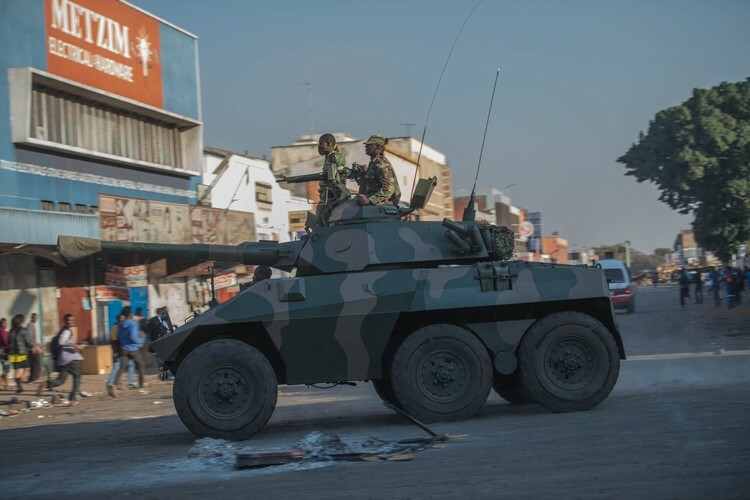 The soldiers chased people out of town towards Mbare township, not caring whether they lived there or not. Within minutes the usually busy streets of town were clear. Many cars which had come into town turned back. As l jumped onto a taxi, a big lorry full of soldiers followed to make sure we went past the bridge into Mbare. They blocked the road into town and fired gunshots into the air. Further into Mbare many people were standing in queues stranded for transport. I was too scared to take photos of the soldiers. It was the most disturbing event I’ve ever witnessed. 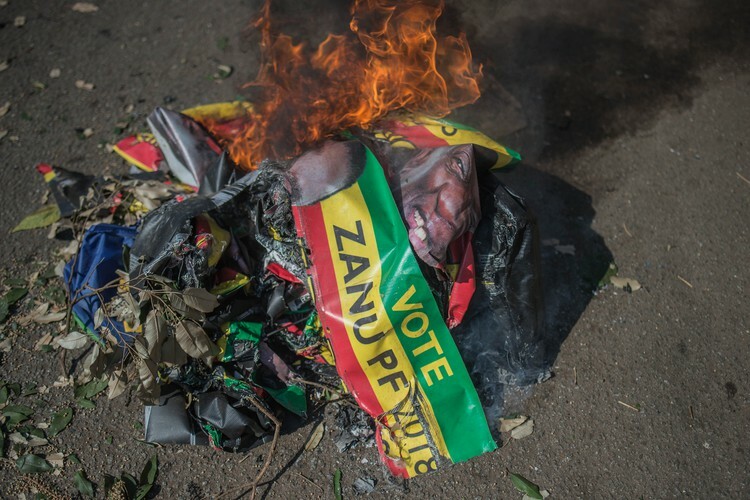 Protesters in Harare burnt ZANU PF posters. Photo: Mujahid Safodien. The author of this eye-witness account for GroundUp was too afraid to be identified.